Here, you can specify any static text that will be used in the subject line of every email. 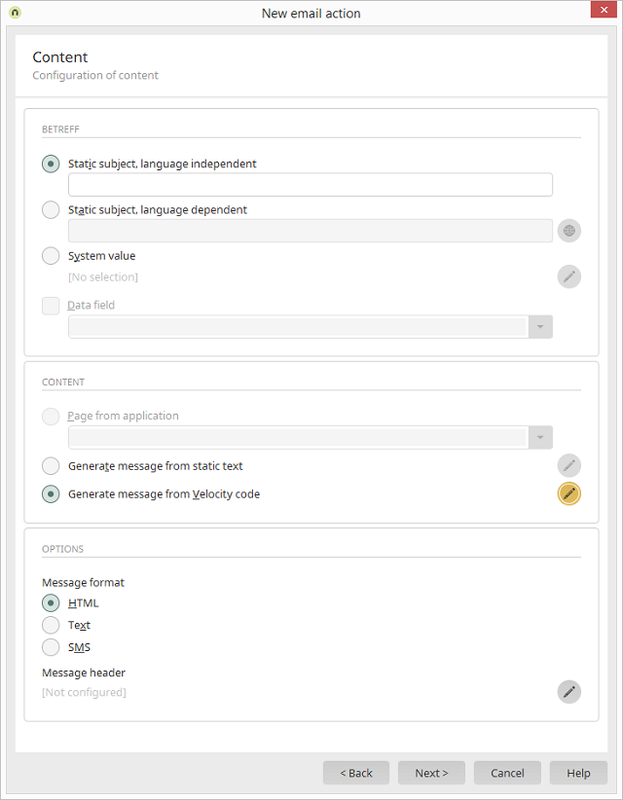 Here, you can specify a language-dependent static text that will be used in the subject line of every email. The language which is used for the subject corresponds to the language used for the email's body. The language is usually determined from the context. Further information can be found in the documentation on Java classes de.uplanet.lucy.server.ContextLanguage. The language can be overwritten with the expert attribute language. Either a language code, e.g. "de" or "en", or a variable from the processing context, which contains a language code, can be used as the value. Opens a dialog where the title can be entered in each of the portal languages. Displays the selected system value used for the subject. Opens a dialog where the system value can be edited. The subject can also be generated dynamically from the value in a data field. Select the required data field from the drop-down list. This option gives you the ability to compose a fixed text for the email. Opens a dialog where the text can be edited. With this option, Velocity script will be used to provide the text for the email. Opens the Velocity editor where you can create messages from the context. With this option, the email will be sent in HTML format. Buttons can then be added to the page, which link to specific pages of the application. If this option is selected, the values in the view and edit fields will be displayed in text format, separated with tabs. If this option is selected, all line breaks are removed, the complete text is placed in the subject, and the message is sent by SMS, provided that a facility to send SMS messages has been setup by your telecommunications provider. Opens a dialog where the header information for the email can be configured.